ORIGINAL STORY: Click here for the original story. As many of you read, we had a little mystery on our hands yesterday. Last night we went up to the cemetery to do a little more investigating of the theories people had in response to the post. Theory #1: It was a tree branch falling. Finding #1: Nope. No fallen tree branches anywhere to be found. Theory #2: It was someone walking across the picture. Finding #2: Maybe, but unlikely. 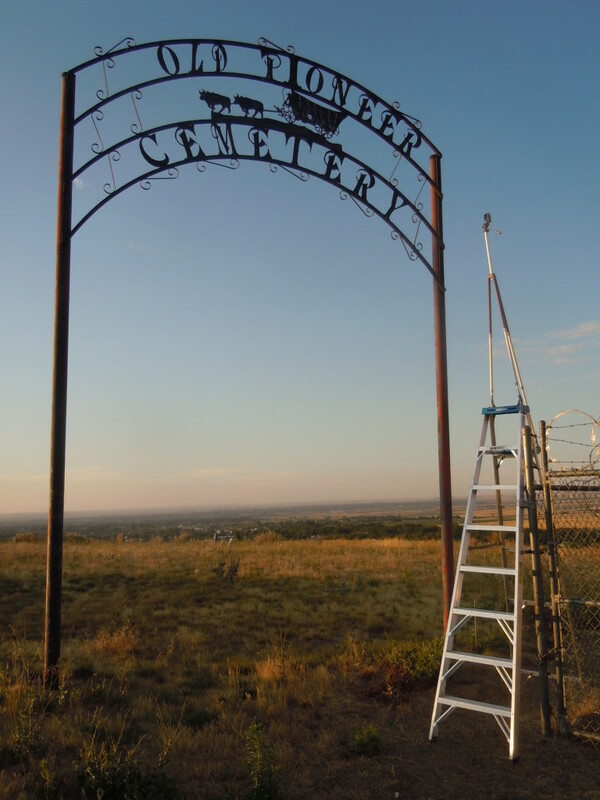 Here is a picture of the location of the cemetery. It’s in the middle of a wheat field – not a high traffic place. Just to get to the cemetery, you have to walk about 3/4 of a mile up the hill. 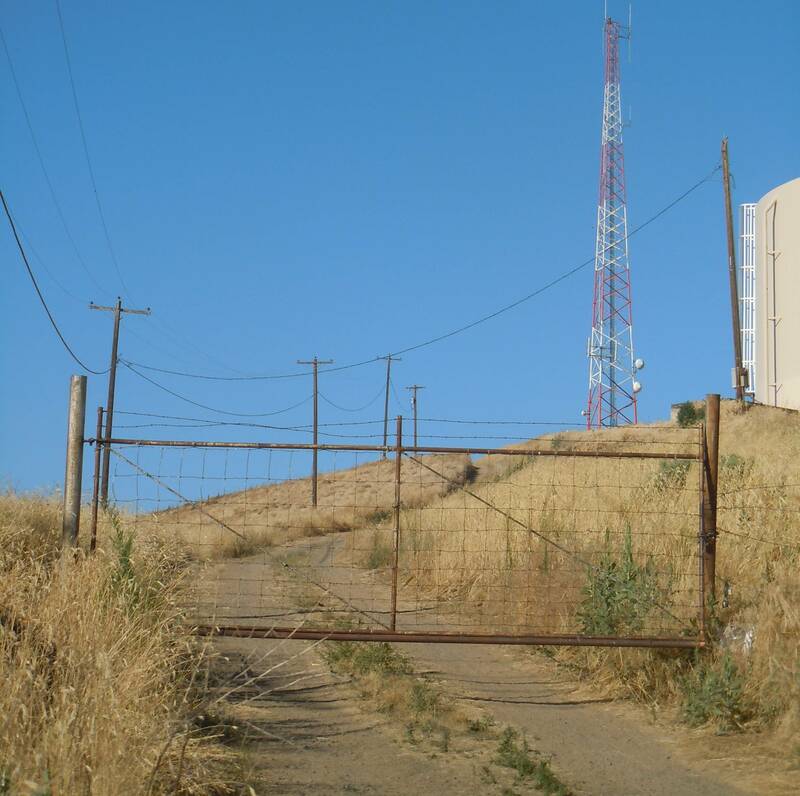 No cars can get up there unless they have the key to this pad-locked gate. 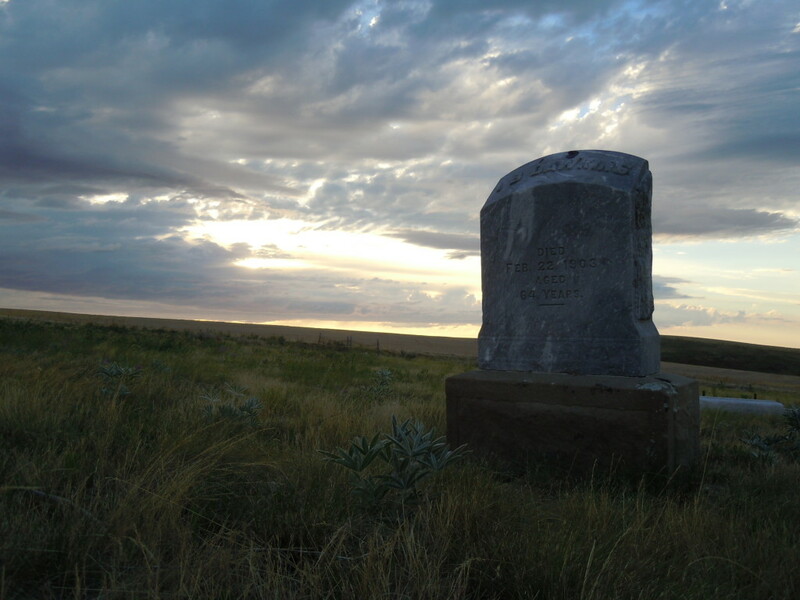 The cemetery is an old one on the Oregon Trail. The first gravestone was laid there in 1868. Most of the people in the cemetery have long been deceased, many for more than 100 years. Family members would not be up their at night visiting their loved ones because all of their loved ones would also be dead. This is a picture I took up there last summer (the person died in 1903). We timed to see how long it would take to get across the frame of the picture. This was not exact, but a person could likely cross there in 30 seconds. My brother-in-law Andy briskly walked the span below in 28 seconds. The problem with this was that when I compared his picture to the one from the night before, he walked much more closely to the camera than the other figured appeared to be. He also didn’t start all the way over to the right of the frame. Theory #3: It was a spec of dust or a bug near the lens. Finding #3: Probably not, given the shape of the figure. Here is a comparison of the figure’s shape next to the picture of Andy in the same spot last night. It wasn’t at the exact same time of night. 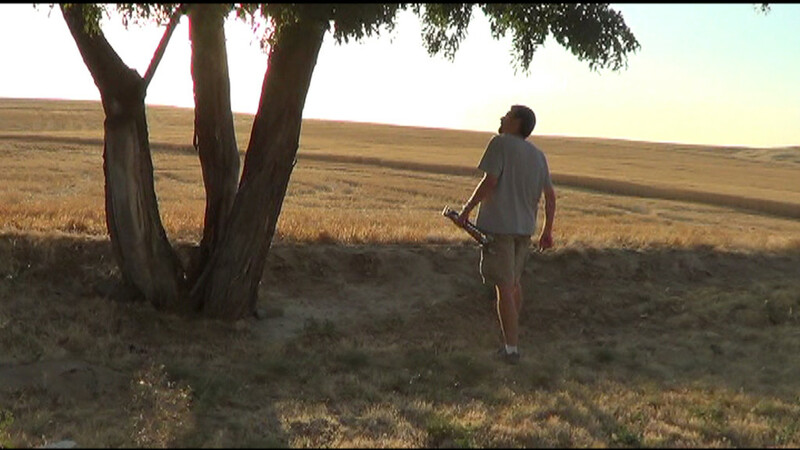 He also walked in front of the tree, when it appears that the figure was behind the tree. LEFT = Figure from the night before. RIGHT = My brother-in-law Andy last night. 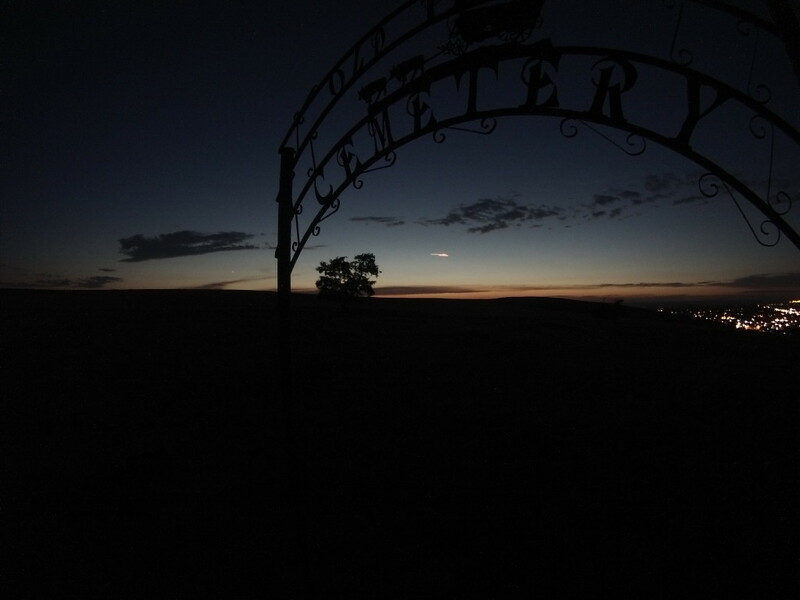 We set the camera up again last night, this time from a place that would capture more of the cemetery. The pictures were nice, but we didn’t discover anything new. There was one image that had a flash in the sky for only one frame, but my wife Tennille said that it was a helicopter flying over. So, the figure from the night before still remains a mystery. 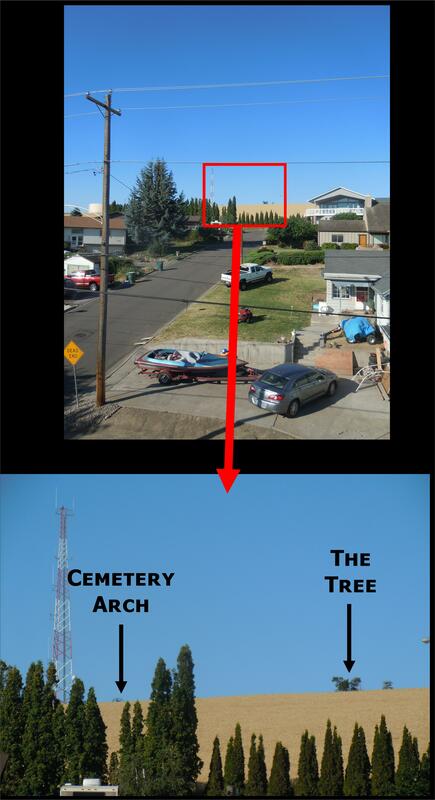 15 Responses to "UPDATE – Cemetery Mystery Still Unsolved"
Since there is no “marker or headstone” by that tree, it would be impossible to find out from old records..who is buried under that tree..I suspect someone is; perhaps a child. It sort of “feels” to me, that the figure is kneeling…overcome by grief. GOOD JOB…thank you for sharing. Nice photos! I enjoyed seeing this, as it reminded me of scenery familiar to me in childhood. I grew up on College Street, where my parents owned a home for 35+ years. It is quite close to the cemetery. Our family of four very routinely walked up to the old cemetery, including in the evenings. We walked the dog there. Actually, I could easily imagine that someone might go jogging up there and would not need to bring a car, as there are many houses in close proximity (below the cemetery). At times, my brother and I probably jogged there when we were much younger (and not easily spooked). In the daytime photo you are in, with the tree, the angle appears to be different, as you can see three sections of the tree, whereas in the other photos there are only 2 sections of the tree. 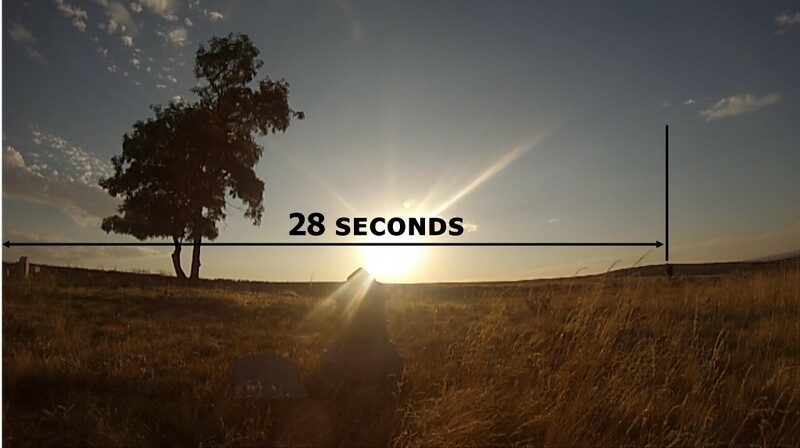 It would be interesting to see the close up daytime shot of the tree from the same exact angle as in the evening photos with the “figure.” That way, a person could look to see if there was a tall gravestone near the tree that might cast a shadow resembling the “figure” at certain times of the evening. Perhaps there is no gravestone in proximity to the tree — I just do not remember, as I’ve not been there in 20 or more years. Other options might be a coyote or dog on back legs going after something that was going up the tree — who knows, though that seems less likely. I’m not sure why it would be unusual for a human to pass by the field of vision of your camera, considering my recollection of how many times my family walked that route in the evening. But curiosity can be sparked by speculating that a place might be haunted, so I found this interesting. Then the question becomes, WHO do you think would haunt it and why? Great pics, and a fun mystery! I grew up outside MF. I posted this to my Facebook page for my MF friends and family to analyze. One person grew up at the base of the hill had a good thought. She used to go jogging up there around the cemetery all the time. She says there are trails up there and a good number of houses at the bottom of the hill. I’m wondering if you walk BEYOND the tree from the point of the camera that you’ll find a jogging trail. Jogging would explain how one could get across the frame in under 30 seconds. Also, the blurry, jagged nature of the figure could be a running person in a jogging outfit. So perhaps that’s your solution–Your ghost was jogging?!?!? Hi Kevin, I’m open to all ideas. There isn’t a jogging trail up there though. It’s just a wheat field behind the tree. my I ask what was your shutter speed during these exposures? It’s a GoPro Hero3 Camera White Edition. I haven’t been able to find the shutter speed. Here are the specs of the camera. I had it set to do time lapse pictures once every 30 seconds. For one I have to ask: What prompted you to take pictures at every 30 seconds, in the first place? For while this may remain a “mystery” to you or some, I cannot exclude the fact, you could have set this up for whatever reason. Even if I wish it wasn’t otherwise. [The appearing and vanishing looks cut; I’ve seen ghost videos/pics and they have a smoother transition from being see-able to fading away. This simply looks like it was placed in there then cut away. But that is probably just the time lapse [empty periods]. 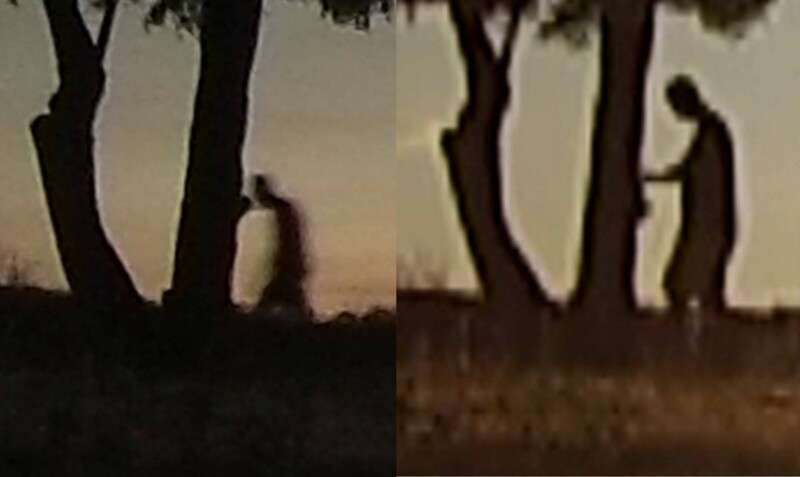 it could have been a person running from outside of the camera view, moving fast enough to be caught only briefly by the camera, before walking out of view behind the tree, where the camera couldn’t catch the person. I just got a new camera that does time lapse photography. I had already tried it a couple of times with sunsets in Milton-Freewater before going up there. My parents had been to town last summer. 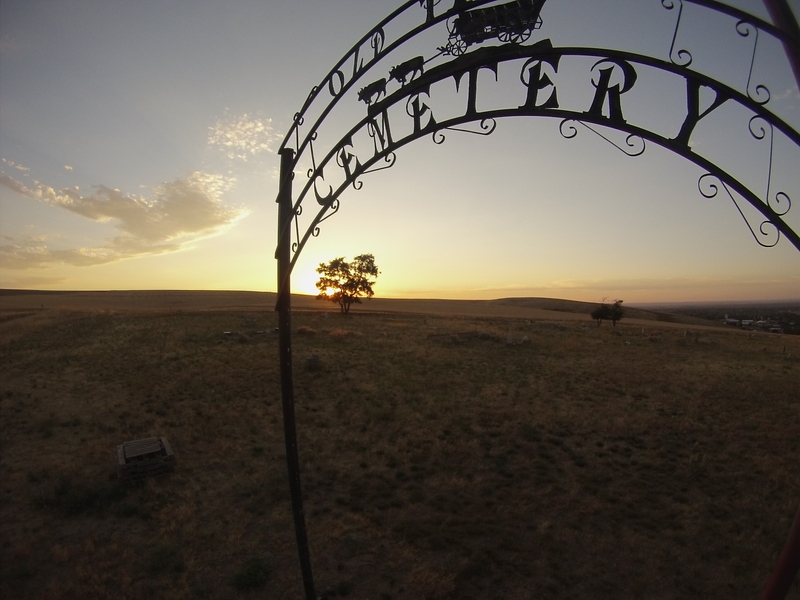 We went up to visit the cemetery since it’s near the old Oregon Trail that my wife had always talked about. I had remembered taking pictures in the sunset up there last year, so thought it would be a great place to put the camera to capture a sunset. I picked one frame per 30 seconds because that’s what was the good amount of pictures for a sunset time lapse when pieced together. I didn’t even see the figure in the time lapse until the next day when showing the whole sequence to someone else. I then isolated the frame and zoomed in which is what you see in the picture. You ought to take a comparison picture with your brother in the exact spot the figure appears to be in. As a loner teenager, I visited the cemetery often. I almost never ran into anyone else, but it was clear that other people passed through occasionally. I don’t recall the view that you captured very well, but it looks like there is a downward slope to the west. If so, I wonder if someone could have achieved the “photobomb” intentionally or unintentionally by walking up and then down the slope while going right to left in the frame. Any chance of more tests? That could be a juvenile Sasquatch. Or maybe even an adult. I would be curious about the slope beyond the tree. Place your ladder out beyond the tree until it’s top is about that same position for comparison from the original camera position. That is an 8 foot ladder correct? If you notice, zoomed in, it looks what we see as a head could actually be an upward stretchered left arm, blocking the actual head from view. Contact me. This could be an important photo. It looks like someone doing a hand stand from an area just a bit behind that spot , whirling UP towards the tree and landing on hands. Reason being, it can’t be a person standing/walking – the neck area or what would be, is too long and curved forward to be a human neck. Looks more like the ‘feet’ at the top of a person doing a hand stand…then the knees bent, then the body, the head and the two arms towards the ground.